Frank L. Stewart was born and grew up in the historic sector of one of Los Angeles’ oldest and renown Black communities. The Los Angeles South Eastside, is where he began his esteemed life in leadership and received both his secondary and professional education. As a Pepperdine University graduate, he earned his B.S., in Business Administration, with an emphasis in Management and Economics, and a Minor in Biblical Studies and Psychology. Being the second son of devout Christian parents, he was taught and received first hand, a “war chest” of fundamental and valuable life lessons. He later built upon these lessons which have served him well and has lasted him a lifetime. 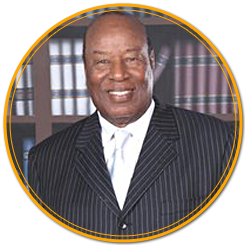 As a Youth Leader, a Mentor, Pastor, a Bishop and now a Statesman, Bishop Stewart began under the leadership of his late Uncle, Bishop E. B. Stewart, (First Jurisdiction of C.O.G.I.C., Northern CA). He first served as Assistant Pastor at Mt. Olive C.O.G.I.C., and later served more than five years as Assistant Pastor under the leadership of Apostle Frederick Price. Bishop Stewart’s ministries spawned vast itinerate evangelism, both domestically and internationally, attracting and winning many through his teaching, preaching, leadership training and ministering to many diverse countries from America, Africa, Asia, Europe and Israel to Mexico, Central and South America, and the Caribbean Islands, including radio and television venues. 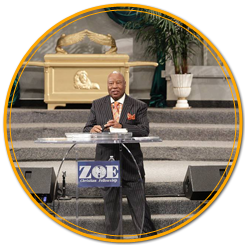 Bishop Stewart is widely known for Zoe Christian Leadership Institute. ZCLI Phase I and II, as it is famously known, was a 2 twelve-week leadership training course, specially designed for adults to discover and understand their purpose, leadership potential and divine calling. ZCLI operated for more than twenty-three years and has an overwhelming three-thousand plus graduates/alumni, ranging in life from the average everyday laypersons to professionals; such as customer service, transportation workers, laborers, administrators, educators, law and medical professionals, just to name a few. Bishop Stewart (after presiding as Pastor for more than five years), began planting Churches during the mid-1980s, which has seen the accumulation of more than twenty-three Churches both domestic and internationally. In January 2016, he was proud and blessed to delegate the overseership of the Zoe Churches to the leadership of Bishop Edward Smith. For over two decades Bishop Stewart has been operating a community center that has been instrumental in working with 60-130 children primarily in the summer time training them in different arts, crafts and special skills that will enhance their productivity as adults. This program is called the Summer Adventure Club. Bishop Stewart’s daughter, Covena, is the director. Out of this the community center which is referred to as Life Community Center, in 2003 has established a pre-school. The school’s name is Ena’s Homeroom Pre-School. Starting out with a handful of children, Ena’s is steadily expanding and becoming a much-needed resource in the community. 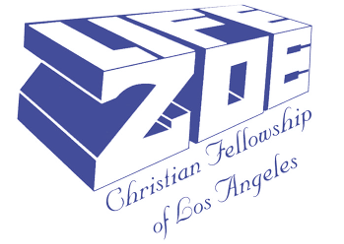 In 2005, Bishop Stewart established the Zoe Christian Fellowship Endowment Foundation. While Bishop Stewart was an active overseer, the association had approximately 22 churches. He was empowering the foundation and each church to have a financial infrastructure to develop charitable funds to service each of their respective communities based upon the various visions of each pastor and the need of each community. The endowment foundation was helping Bishop Stewart as an individual to help others to fulfill their calling to an entirely new level, because of the financial support it potentially offers. To Bishop Stewart’s acclaim is his non-profit organization, “Black American Family Christian Agenda”, commonly known as B.A.F.C.A, which he started during the early 1990s. B.A.F.C.A. primarily focused on establishing conferences that brought together, the Black Churches, the Black communities, and political leaders, for the purpose of building and esteeming Black Americans throughout this Nation. Also, Bishop Stewart is now the Chairman of Clergy Council for the Center for Urban Renewal and Education (C.U.R.E. ), which provides several integrated and innovative programs to tackle what is considered core social problems in our Nation’s inner city communities. Bishop Stewart has authored a few books; “Together We Stand Strong”, “The Secret Gifts of Black Americans”, and the best seller, “How to Share the New Birth and the Gift of the Holy Spirit”. 90016 | Landmark: We are three blocks east of La Brea Ave, North of Adams Blvd.